Waffen-SS 8cm mortar team from Warlord. A few 28mm Panzer Crew figures. Old Warlord games figures, possibly from way back when they were still BAM (Bolt Action Miniatures) I think? The faces on these were not the best, particularly on the single figure, though the other details were pretty good. Some Deutsches Afrikakorps Marder IIIs with the Soviet 76.2mm gun. Models by PSC: the crews are in "Panzer Wrap", so not really suitable for North Africa. Lacking anything better I painted them up in the DAK olive green anyway. The excellent PSC plastics are a joy to work with and far superior to BF resin & metal. 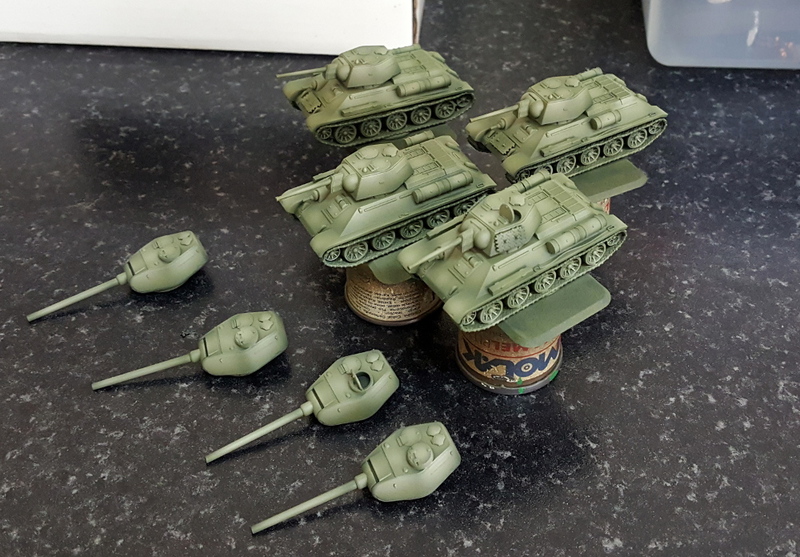 Some old PSC T-34s, aiming for a fast job. The ideas is to use 3-layers of colour in a quick ersatz modulation style, apply decals and do chipping, then apply an overall enamel wash, but thinned to a heavy-ish filter consistency. Now, it won't detail as well as a proper pin-wash, but it won't take as long either. Which is the point here as I just want them for gaming, nothing fancy, and don't want a serious time investment. So far so good, but the wash will make or break them. They should be good enough for gaming purposes in any case. BF plastic Chieftains from the Team Yankee range. Out of the box build, nothing fancy. Gun sleeves came out a bit too light, need toning down. DPM on the crewman needs a bit of work too. Lovely models except for the smoke dischargers...seriously BF? SS-Aufklärung, ostensibly painted for a "KG Knittel" force for FOW, plus a few extras (for other units, but done the same way). Some older stuff I had not posted pictures of: a few Sd kfz 10/5 2cm Flak vehicles. 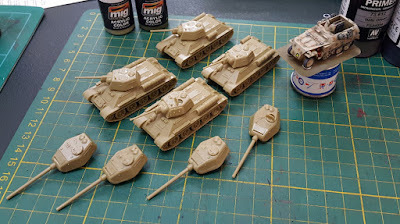 Following on from the previous WiP post: they're not too bad, pics aren't great, but they''ll do.